Here at The Spindle Shop we pride ourselves in making top quality hand spindles that combine beauty and function. The spindles we make are primarily tools to be used, and we spend a lot of time developing products that not only look good but are rewarding and easy to use. The balance and spin is checked and corrected as needed to ensure you will get a spindle that has no wobble, and will feel like a dream to use. We produce heirloom quality products that will last you a lifetime when cared for and stored appropriately. We support our products with a guarantee of replacement or repair in case of defective materials or workmanship. As far as possible we use locally sourced wood that has been ethically felled and sustainably harvested. All our spindles are made here at our small workshop at Crystal Waters, Queensland, Australia. If you would like to find out more about Crystal Waters Eco Village here is a website. If you cannot find a spindle that suits your style or if you like the look of a spindle that is in our sold items, feel free to contact us and we will see if i can make one for you. (This will not apply to limited edition releases as they are unique designs and will not be made again.). 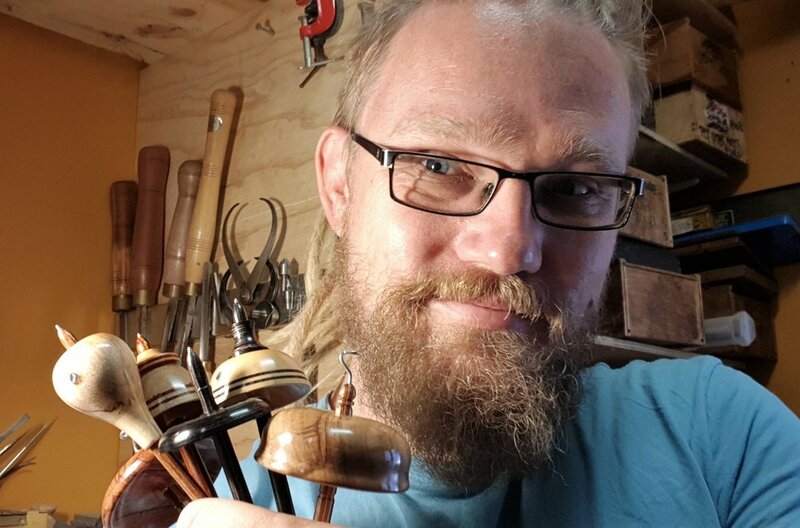 I (Jory Freyee) have been an apprentice spindle maker for Malcolm Fielding since early 2015. I have had a love for wood my whole life, from growing up in a bush land community in the Sunshine Coast hinterlands, playing in trees and making cubby houses from the age of 5. My father showed me how to use wood in wondrous ways as he built many of the houses around the community Crystal Waters where I live, showing me the strength and longevity of certain woods and flexible strength of other woods, I helped him build eco-friendly houses when I was very young, but really took a shine to it when I was in my early twenties. It was then when he really took me under his wing, and showed me how to put a house together, at that point I fell in love with the small scale appearance of wood, getting right down to the detail of the grain and showing off the best most intricate bits of the wood. Just at the point where dad was receiving less work, i meet a new resident of Crystal Waters, Mr Malcolm Fielding, he informed me of a small business he had making spinning tools, and I persuaded him to show me his workshop and what he was making. I fell in love with the works of art he was making, after seeing my enthusiasm for the work he was producing, he asked if I would like to have a trial in making the beautiful spindles myself. I jumped at the chance and started finding my feet helping him and learning how to turn wood, and slowly built up my skills and knowledge under the careful eye of the master craftsman. Eventually a couple of years later when Malcolm decided to retire he asked if would be interested to take over the business. After careful deliberation I decided that i could not let all the skills that i have honed over the years, and my love of wood flatline, so I said I would love to, now I am the proud owner of the Spindle Shop brand name and it’s my aim to keep the tradition of making beautiful, unique and well crafted spindles alive. I will be working to continue the high standards of function and quality at The Spindle Shop that Malcolm established, but also I am excited to combine new and old techniques to take The Spindle Shop products into a new phase, exploring my own creative ideas, and expanding my own range of skills. I am so excited to see where The Spindle Shop will lead me, and in today's technological world where so much is machine made, it is a honour and a privilege to have the opportunity to keep the skills of the hand maker alive. A Short little piece on Malcolm and I from a couple of years back.